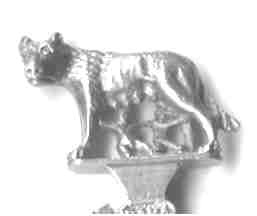 Italy has a long tradition of making interesting silver. 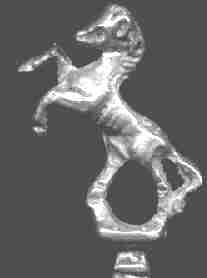 Old pieces of Roman silver flatware have been uncovered and are found in a few museums. 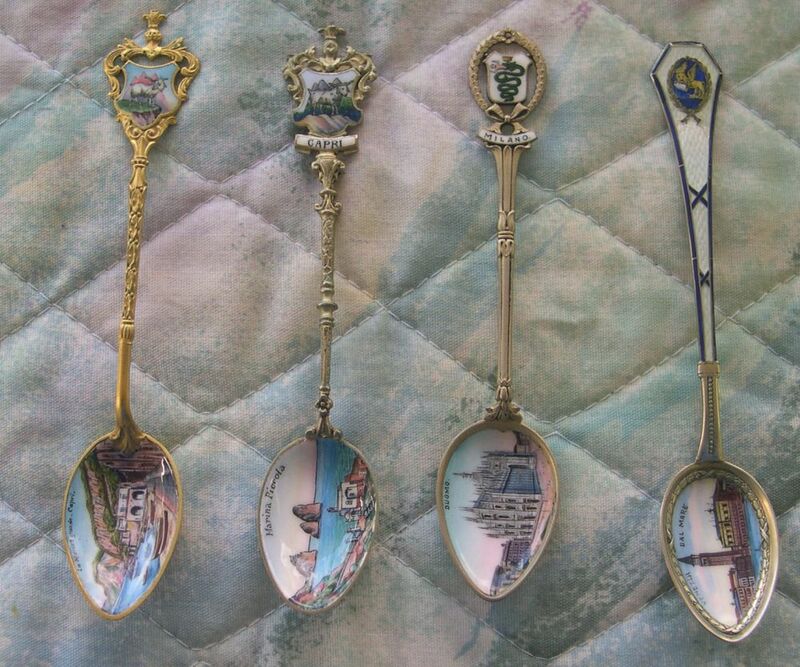 For souvenir spoons, the Italians used designs from their very large collection of works of art. Detail pictures are shown for these spoons, because the incredible amount of detail in the pieces is lost when the whole spoon is shown. 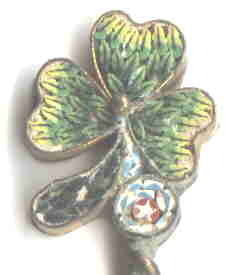 Micro-mosaics are an Italian specialty. Some absolutely stunning decorative pieces have been made from exceedingly tiny tesserae (glass tile chips). 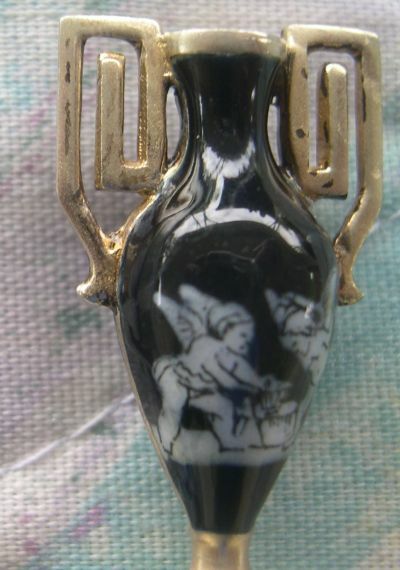 This spoon is one of the better examples of micro-mosaics found on spoons, but in quality it barely compares to the workmanship of the 18th century. 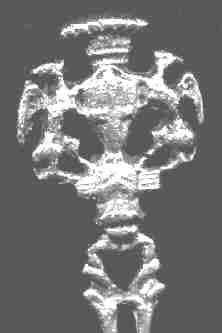 From the picture it is hard to ascertain the incredible amount of work on this spoon, but each part of the design is a very tiny piece of mosaic tile. 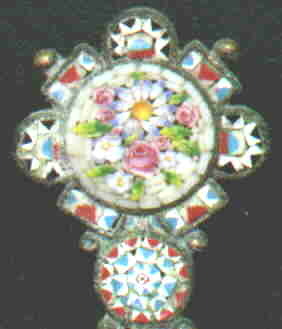 The round picture of the flower in the finial, for example, contains about 200 separate pieces. The actual diameter of the circle is about 3/8th inch (10mm) and the picture was enlarged 300%. (it may be even bigger depending on your monitor). Hopefully this will give you a better idea of the workmanship. Note: these spoons are also available in a non-silver version. 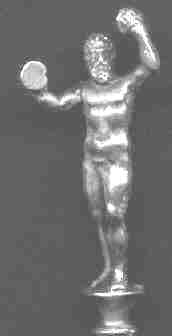 The cheaper metal version is not the same quality workmanship. 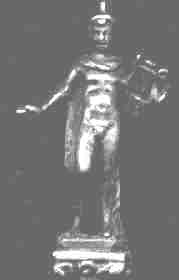 Also, be very careful that none of the tesserae are missing as any missing pieces reduces the value very substantially. 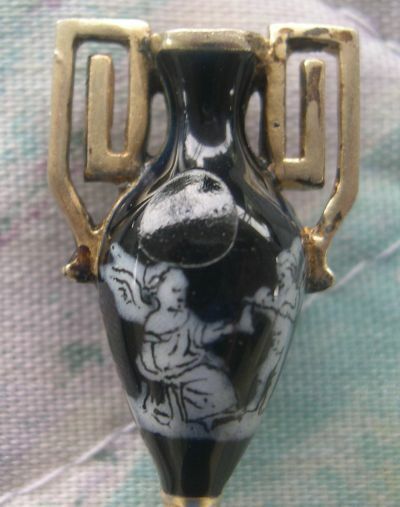 A number of different variations of this Pompeii vase spoon are available. 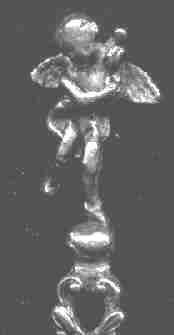 These are among the nicer souvenir spoons that are available to visitors of Pompeii.. 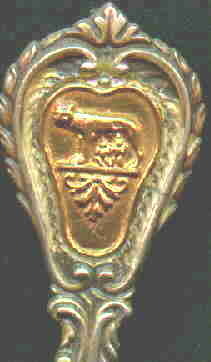 The bowl of the spoon is marked 'Napoli' (Naples) and shows Mt. Vesuvius in the background. 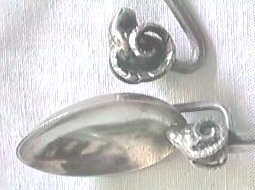 These two spoons are replica's of old Roman spoons found in ruins. 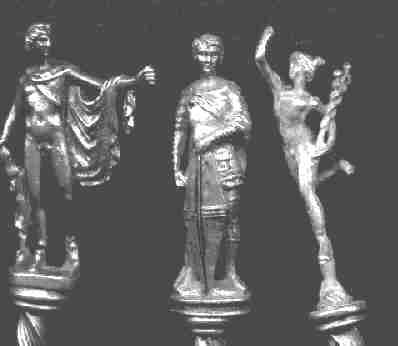 The pieces are very three dimensional and do not show well in a two-dimensional format (photo).Most of the choice old Roman spoons are in museums or the property of large institutions, and even these quality silver replica's are fairly rare but it is still possible to find a number of different examples. 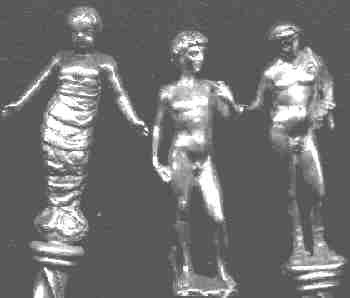 Please note that there are a number of dealers on the internet who claim to be selling genuine old Roman spoons. I have absolutely no idea how to verify the age of these old spoons or even if they are genuine. If you buy these pieces it is strictly caveat emptor. 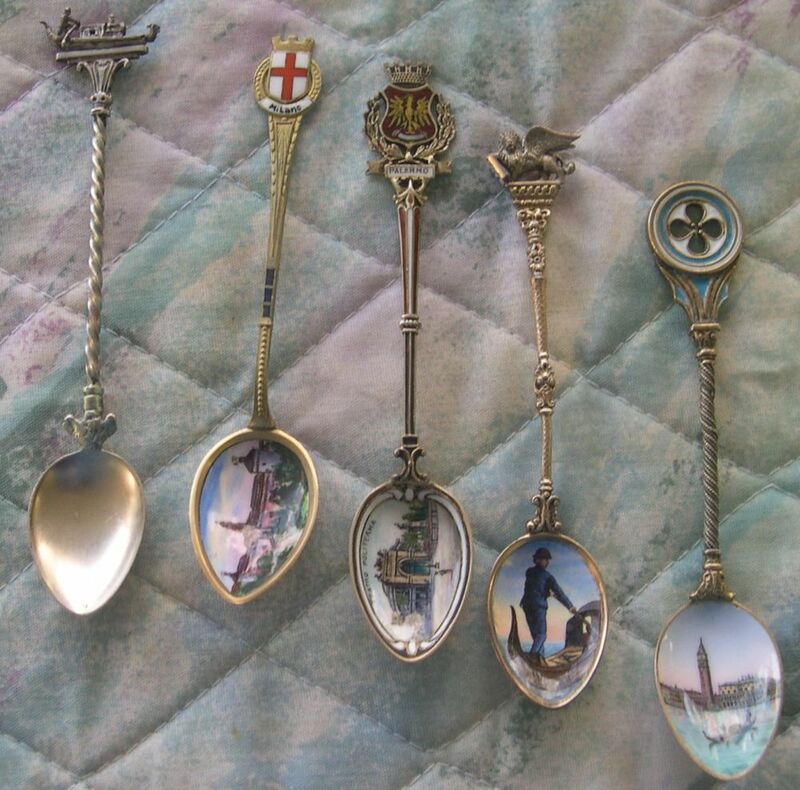 I personally enjoy the finely detailed and cast finials of statues found on Italian spoons. 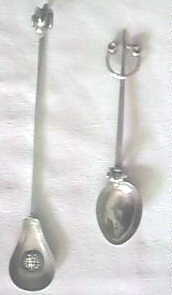 While these spoons are not extremely valuable, they do represent some fine silver workmanship. 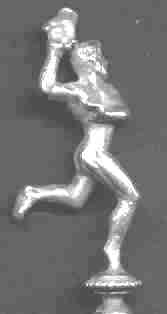 Runner holding "hand of God"
This spoon is marked "832". 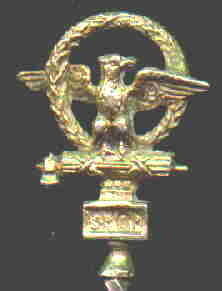 I do not know what this marking means (830 is used in parts of the Austria- Hungary area" It does appear to be very similar to other Italian spoons. 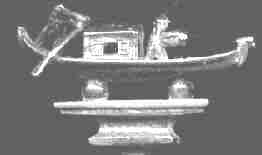 The bowl is engraved with the word (I think) "Antulerhen?". I don't recognize this place name. 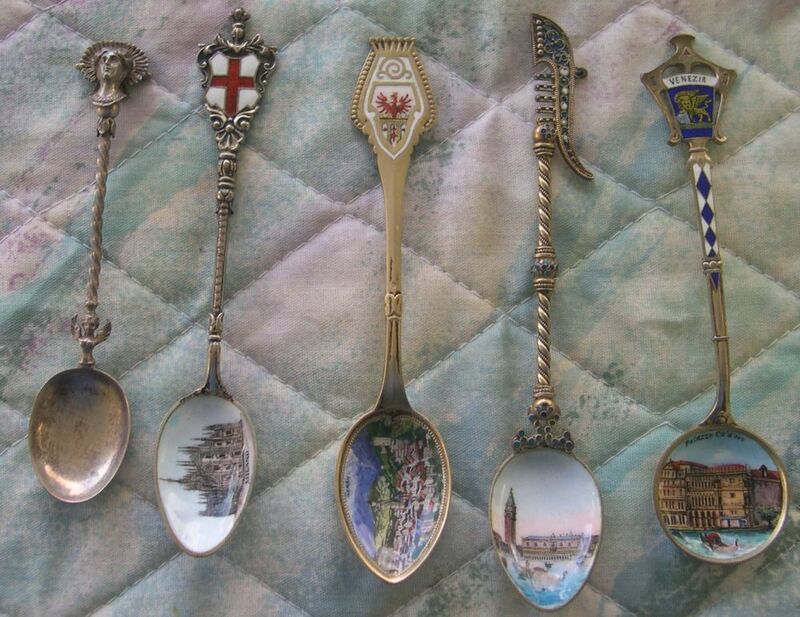 Note: there are a very large number of spoons with different stems, finials and unusual bowls which are marked "Italy". These spoons are made from a cheap form of pewter and were imported into the USA in very large quantities after World War ll. These spoons are NOT old (despite the way they look) and they are NOT valuable (just a few dollars each). 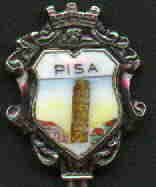 Note: Italian silver spoons are marked with the number "800". However, be aware that "800" has no legal meaning in the USA. An Italian company is now producing new silver plated flatware which is marked "800". caveat emptor.